A deep-dive looking for hidden gems in the Peabody Awards Collection; an examination of how criminal defendants are portrayed in the media prior to trials; and an evaluation of attitudes by millennials toward LGBTQ couples in advertisements…these are just a few of the research projects Grady students are conducting through the Center for Undergraduate Research Opportunities this spring. This year’s CURO Symposium takes place April 8-9 at the Classic Center and will feature oral and poster presentations from UGA students, including 12 Grady College students. “You don’t have to be a science major to be a CURO participant,” Sierra Brown, a third-year advertising major said about a common misperception about the program. CURO is open to any undergraduate student who has a faculty-mentored research project. Brown, who is also a CURO assistant, began her studies at UGA as a science major and switched to advertising. She said CURO provides her a stage to still pursue her interest in science, but to also explore topics relevant to her future career. A sample of the ads that were shown to subjects to determine brand attitude in Sierra Brown’s research. “#AdsAsAdvocacy: Exploring the Relationship between Brands’ Pro-LGBTQ Social Media Posts and Consumer Behavior” — Brown has been working with Glenna Read, assistant professor of advertising, to research attitudes of socially-conscious millennials. 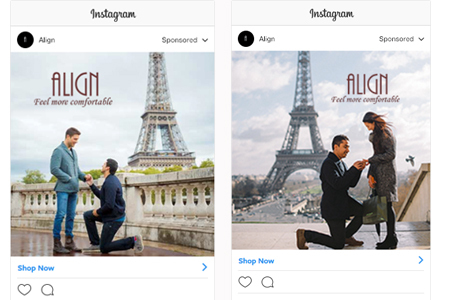 A set of four advertisements were shown to subjects via social media: some portraying LGBTQ couples and some portraying heterosexual couples. Questions were asked about attitudes toward the brands, to see if there was a difference in the attitude toward one brand over the other because of its imagery. Care was given in creating these messages and making them seem authentic. Brown found that her research ran counter to her assumption that millennials would be equally accepting of LGBTQ advertising images, and there was not as much acceptance as expected. Overall, it was a big learning experience for Brown about how people respond to ads with LGBTQ imagery and how their responses relate to their expressed values. She looks forward to continuing this line of research in the future, maybe next time adding some variables about race or adding psychophysiology variables, where people say they will behave in one way but act in another. “I was surprised at how non-intimidating the process turned out to be,” Brown said about her CURO research. Brown will present her research on a poster. “Analyzing the Peabody Archive” — Exploring the archive of Peabody Award entries has been a familiar theme in Thomas May’s college experience. What started in a class on television history with Taylor Cole Miller, the Peabody Media Center Academic Director, grew into serving on the Peabody Student Honor Board. Last summer, May started working part-time as a senior student archival assistant at the Walter J. Brown Media Archives & Peabody Awards Collection at the Richard B. Russell Special Collections Libraries. May has combed the archives looking for hidden gems, as well as uncovering themes through the 78 years of archived entries. A special emphasis about how local programming can be preserved is part of May’s research. 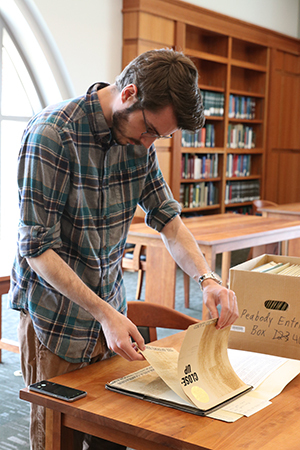 “The main goal is to present different ways that the archive can be used for research,” May, a fourth-year EMST student said. Through his work, May has examined themes ranging from how farming has evolved in Nebraska to media portrayals of the Soviet Union during the Cold War and how American ideals have been affected. Along the way, May has found some rare footage of Lucille Ball in a pre-“I Love Lucy” broadcast and a signed copy of “This I Believe” by Edward R. Murrow. May, who is focused on a career of television development and writing, said the research has provided some historical significance and awareness for his future career. May, who is a CURO assistant, will give his oral presentation April 8 in a block of time between 1:25 and 2:15 p.m.
“The dialectic between the First and Sixth Amendments” — For third-year journalism student Ashley Soriano, CURO presents an opportunity to blend her career aspirations of journalism and law. Soriano’s research takes a look at freedom of the press guaranteed in the First Amendment and relating it with the right to a free trial, outlined in the Sixth Amendment. Soriano’s research studies how trials are covered through platforms like podcasts and social media and examines how media affects the public’s perception of defendants before trials. Her faculty mentor is Jonathan Peters, assistant professor of journalism, and expert in First Amendment principles. “You need the media to cover a trial because it’s important for people to know about it, but you also need a defendant to have the right to a fair trial,” Soriano continued. Soriano concluded by explaining that this is a great program that expands the education of students beyond the classroom. Soriano will present her research at 12:20 to 1:10 p.m. on Monday, April 8. In addition to the faculty mentors listed above, James Hamilton and Michael Cacciatore are mentoring participants who are not Grady students.